After 666 comments, a friend of mine was kicked off Metafilter. That was ten years ago. He told me his old screennames over drinks a while back, and I spent the rest of the evening reading the archived posts. 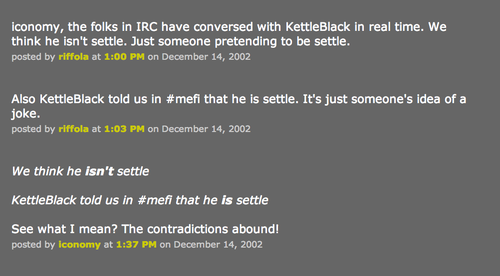 As “Settle” and later, “Kettleblack” he was often “cryptic and awkward,” as one commenter complained. But there was something honest about his writing as well, (which, of course, I say with all the biases of an AFK friend.) I can see where what he was trying to express wasn’t quite what was being said. The frustrations and loneliness compiled into posts that were illegible and diffused. However warm and welcoming an online community may be, it is still words on a screen. What do you write when words to express yourself fall short but the desire to be heard is still strong? How did it begin? Did you have any real sense of the identities of the other people on Metafilter? my first posts were actually pretty civilized. I gathered a sense of who the colorful people were, but I got the impression that the people who were most interesting AFK were not the most amusing people on there. What do you mean by that— like the wittiest people clearly put a lot of time into their answers? No, like there was a group of people who used the site for earnest discussion because they were having their emotional needs met by reality, and then the rest of us. I think I confused this earnest discussion for sadness on some level because a lot of my first posts were childish attempts to bring some levity into the family. To get reactions from people? Or just to put yourself in the discussion on your own terms? It evolved into a game of course where I was pitting an increasingly imaginary version of myself against a lot of other characters and then a bunch of innocent librarians and programmers. How soon did things change? So since the people I was stalking was stalking someone, I stalked them, and that was my first post, a series of usenet prank artifacts. One of the guys in on these antics is now a pretty prominent business techno-blogger. Which I had been reading since 1999 or so, a long long time. It centered around these incredibly close online friendships, it was basically chat logs between these guys, I wanted something like that. Precisely, and you can see how poorly I read that situation. In retrospect it is absurd to think that anybody but me could have even passing interest in that. Sometimes, I definitely liked stretching the limits of the allowable html. I think especially Kettleblack had some extremely creative formatting. Remind me again what were you doing on Poemranker? And also this actor in LA, who I met once. Could you see how many people were reading? yes, and it gave me great pleasure. Some of the outraged comments were delightful. homosexuality suggest that you are a child pretending to be an adult. “Does it all have to be in capitals? I feel like I’m being shouted at. were most of the people there sincere? I would feel this urge to show them my AIDS poemes. It was ahead of its time. It is still pretty unique in how diverse and large yet homey it is. Again this is what attracted me to it as opposed to, I don’t know, Fark I guess. Oh that’s right. And that kind of deep reading is probably what kept you on the site then, right? yeah, people generally were so much more invested in conversations online then. it makes sense. so they would remember your interests, habits…even in a negative way. how did you get kicked off the first time? Yes, any time your bad behavior leaks out of the internet it is a big mistake. It only took a few such incidents to make me realize that. were you in touch with the people behind the site as yourself ever? what happened when you were banned? you couldn’t login again? or did you get some kind of message? and KettleBlack was kicked off the site too? did you try again after that? How do you feel about this experience in retrospect? you think these people are horrible or just working things out? do you fall into these habits anymore? you don’t think of it in retrospect as just testing things out? it was just reaching out to anybody in general? Some of the most overwhelming experiences I have involved nothing more than realizing that whatever weight my consciousness had others had too in equal measure. Online relationships keep me from feeling that. online relationship feels out of balance? but you want these people to see it though? for the same reason confessing anything to someone close it hard, right? I’m not online friends with people anymore, I gchat with family and people I know now. How boring.